We are at the venue only during the day/time of our lessons. Notice: ＊The classes in Morning Course are all full. ＊The class for complete beginners in Saturday Course is full. Apr. 9 ~ Jul. 11 (exc. Apr. 30 & May 2) The classes in Morning Course are all full. Cost Tuition will be 7800 yen for 26 lessons. Textbooks cost extra. Tuition fee per term. If you enroll in the middle of term, above amount will be deducted per lesson basis. Term 10:00 a.m. ~ 11:45 a.m. every Sat. Apr. 13 ~ Jul. 13(exc. May 4) The class for complete beginners in Saturday Course is full. Cost Tuition will be 3900 yen for 13 lessons. Textbooks cost extra. Term 6:30p.m. ~ 8:15p.m. every Tue. Beginners ~ Intermediate class (Morning & Saturday Course). No complete beginners' class(A), B & E-class in Evening Course. Kanji Class is not on schedule yet. 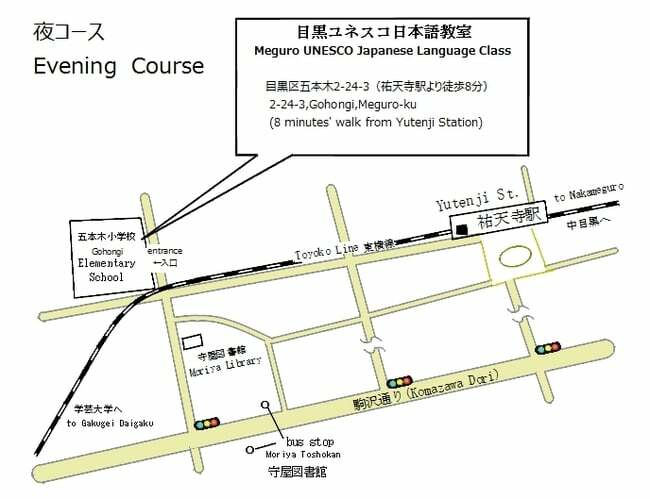 Instructors, who are the members of Meguro UNESCO Association, have been trained in teaching Japanese, and work on a voluntary basis. 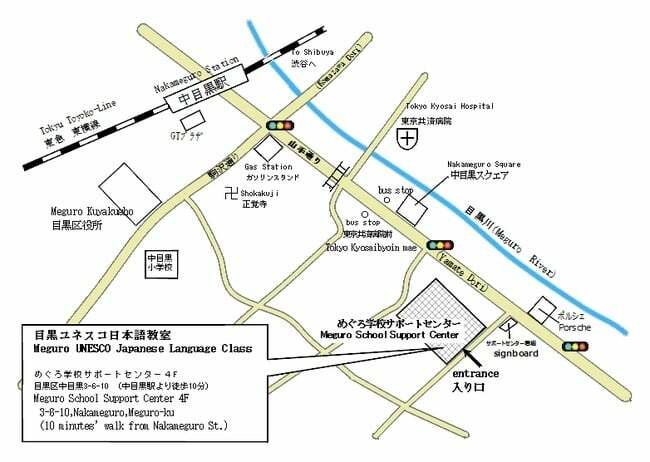 At the venue on day of class If you enroll for the first time at our Japanese Class, please contact us in advance with your name,nationality, e-mail address,address with postal code and phone number by fax or e-mail. ★Please notice that we might not accept if participants exceed 15 people for each class.